With the help of the internet, explore these ways to create some new Thanksgiving traditions in your congregation and community. Turkey and dressing. Football and parades. 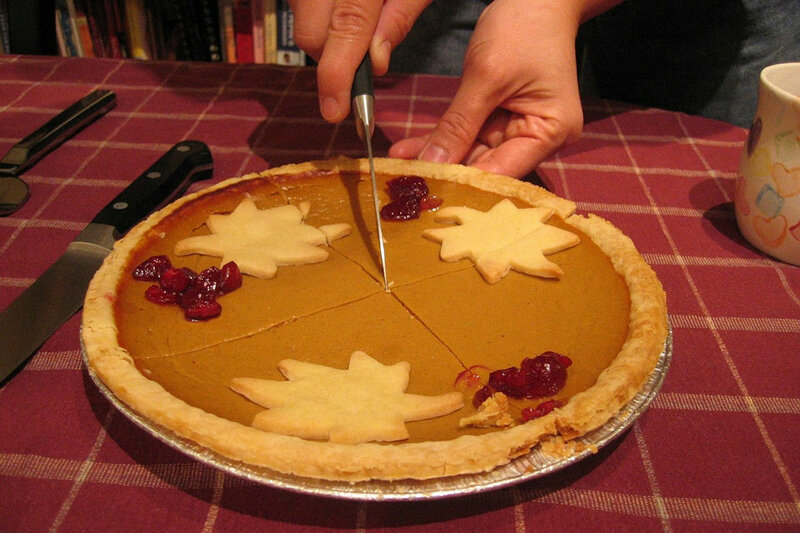 Americans have a variety of Thanksgiving traditions. If you are trying to figure out how your church can participate in the celebration, the internet offers a variety of ideas and tips to help make the preparations easier than ever. Perhaps the most common form of Thanksgiving celebration is a meal. Take the opportunity to thank God for your congregation and host a fellowship event in honor of the holiday. Host a church-wide meal. Ask volunteers to cook turkeys provided by the church and have all attending bring side dishes, desserts and drinks. To make sure that you don’t wind up with 20 bowls of mashed potatoes and no greens, use sites such as PerfectPotluck to organize who brings what. To add a little flare to the event, ask your volunteer chefs to explore different ways to cook the turkeys. If some of your chefs are inexperienced, make sure they check-out turkey-cooking tips for safe preparation. If your congregation is too large to host one big meal, consider getting together with your small group or Sunday school class to celebrate. This is an especially good idea for online small groups who don’t see each other very often. Since most people have plenty of turkey and dressing this time of year, check out the variety of turkey-less Thanksgiving meals online. Remember, the goal of the event is to express thankfulness for the body of Christ, not to add more pressure to an already stressful time of year. You may want to just meet together at a restaurant or order pizza. The idea is to share time together while enjoying a meal. Make your Thanksgiving a cultural affair. In the tradition of the pilgrims and Native Americans, there couldn’t be a better time to get to know people in your community who may be different from you. Host a multicultural Thanksgiving meal, or encourage families within your congregation to look for opportunities to invite families of different nationalities into their homes. Ask the visitors to bring a favorite dish, or explore what different cultures eat for Thanksgiving harvest celebrations and try making new dishes of your own. Many — but not all — in your congregation will celebrate with one or more big meals with family or friends. Your members may wish to skip an extra meal for themselves and instead provide a meal for someone else. Honor nearby military families, firefighters or police officers with a special meal this Thanksgiving. (You may want to check and see if other meals are being provided, so they don’t get turkey for four days in a row.) On Thanksgiving Day, you might want to cook to-go meals or special goodies to take to police, firefighters, emergency workers and hospital staff who don’t get to spend the holiday with family. Social media and smartphones make it easier than ever to help get your congregation in the Thanksgiving spirit. Facebook, Instagram, Twitter and even texts can be great ways to share the Thanksgiving spirit. Join the fun of Facebook. Post a Thanksgiving-related question on your church’s Facebook page and ask for comments. For example, “What is your most memorable Thanksgiving and why?” Check out these Top 10 UMC Facebook Posts to get those creative juices flowing. Post a new question each day. Post Scripture verses, quotes from a Thanksgiving sermon or liturgy, prayers or even memes. Rejuvenate your blog by writing special Thanksgiving messages. Involve your readers in the discussion by encouraging them to comment with their own expressions of thanksgiving. Participate in a month-long celebration of thanksgiving by posting something for which you are thankful each day. Think about specific things related to your church and congregation as well as your personal life. Ask volunteers to shoot videos with an “I am thankful for …” theme. Post these on your church website or Facebook page throughout the month of November. Or recruit volunteers to produce a special marketing video to show the Sunday before Thanksgiving. Encourage your children’s classes to write Thanksgiving poems or stories. Teachers can find great Thanksgiving writing prompts and printouts online. Ask children to read a few selections during November worship services, display copies on bulletin boards in the hall, and post a few on your church website. For safety, include only the author’s first name. Perhaps the best way for your church to express thankfulness any time of the year is to share your blessings with others. Ask Sunday school classes or small groups to look for volunteer opportunities or choose a special community outreach project to complete during November. There also are lots of outreach ideas for families. Serve at a shelter, feed the homeless, visit a nursing home or check out the Red Cross, United Way or Salvation Army for other ways you can get involved. Organize a church food bank or stock the shelves of a local community food bank. Check with the food bank to see what items are most needed. Then, designate one Sunday for the congregation to bring those items into the church. Ask volunteers to deliver the food to the food bank after the service. Ask church members to submit names or contact your local school counselors for the names of needy families. Then, recruit volunteers to collect donations of food and assemble food boxes to be delivered to the families the week of Thanksgiving. Remember that your blessings go beyond food. Contact local charities, including those who serve veterans, foster children and prisoners. Ask how your congregation can help. Often they are in need of gently used clothing, hygiene items and cleaning supplies, as well as food and other small gifts. Conduct a Black Friday outreach. Black Friday has encroached upon the Thanksgiving holiday causing many employees and consumers to spend the holiday working and shopping. Take goodies to the customer service desk of local stores. Ask the manager to put the goodies in the break room as a way of thanking the employees for their hard work during the holiday season. Or pass out cups of coffee and cocoa and doughnuts to people standing in line. Use the opportunity to start conversations with the waiting customers about your church and your relationship with Christ. However your church chooses to celebrate Thanksgiving, make it easier on all those involved with simple event registration. Take advantage of all the benefits that technology offers in your efforts this November.